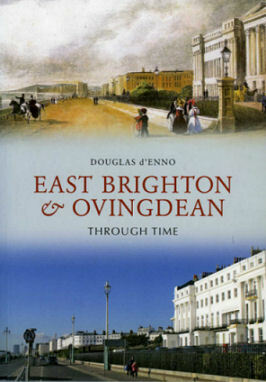 This new book by well-known local author Douglas d’Enno, takes the reader on a carefully planned tour of a large and diverse segment of Brighton, using illustrations which in many cases have never been previously published in a book. Unusually for a ‘then and now’ study, early prints and colour paintings are also featured. The fascinating selection of more than 180 photographs traces some of the many ways in which East Brighton and Ovingdean have changed and developed over the last century. The journey takes in the three major parallel roads that traverse East Brighton then proceeds north, via Queen’s Park to Race Hill. Views of the various estates built to provide much-needed new housing for an expanding Brighton follow. A return is made to the coastal portion with stunning and sometimes rare views of Black Rock and the Marina. The images then take us eastward through Roedean to Ovingdean, once a sleepy farming village now transformed into a suburb of desirable residences. We are a charity based in East Brighton and are looking for someone to write a short history of the school and college. Can anyone point us in the right direction ? St John’s, Walpole Road and Seaford, I think.